At G.T. Campbell Plumbing, we offer professional sewer cleaning in Rochester, NY and the surrounding areas, and you can count on our expert plumbers to get your line running again in no time. A clogged sewer line is one of those problems that no homeowner ever wants to face. Unfortunately, it’s a relatively common problem that can spell disaster, especially when not addressed by a sewer repair expert immediately. Since your sewer line is responsible for safely transporting waste away from your home to a sewage treatment plant, a clogged line is a serious concern. Sewer clogs may be caused by numerous things. Foreign objects in the system, grease, and even tree roots can all form large blockages that prevent raw sewage from flowing through as it should. In severe cases, the clog can cause sewage to back up into your home’s basement or crawl space, resulting in a serious health hazard. Whether your sewer line is completely blocked or you’ve just noticed that your drains or toilets are running slower than usual, it’s important to contact a plumber right away when you suspect a clogged sewer line. When you contact G.T. Campbell Plumbing, we will dispatch an expert plumber right away. Our technique for cleaning sewers is safe and will not cause damage to your sewer line. We can remove even the most stubborn clogs in just a matter of minutes in most instances. 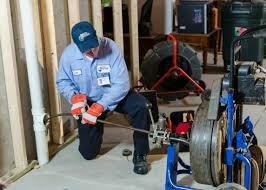 When you need Rochester sewer line cleaning, depend on the experts right here at G.T. Campbell Plumbing. No-clog is too large or too small, and you can count on us to get the job done right the first time, every time. If you have a clogged sewer line in the Rochester area, contact G.T. Campbell Plumbing today.